They say that behind every great man there is a great woman. That's certainly true for if I say no to that, The Wife, Ph.D., will unleash her wrath upon my poor soul and have the local authorities cuff me, blindfold me, stuff me in a Cyprus potato sack and put me on the first flight back to Quito. For the purposes of this blog, however, there's also a man who has patiently showed me the ropes to the world of wine. I am referring to the French Connoisseur, owner of a veritable stock of French wines, Le Nez du Vin Wine Aroma Kit and a whole lotta everything else French-and-wine-related running through his veins. Along with the Man Who Lost His Sense of Taste, he runs Oenothiki, a wholesale distributor of quality French wines on The Rock. I believe the only thing the French Connoisseur loves more than wine (excluding his family, of course) is to suffer through marathons, triathlons, impossibly long bike rides and any other endurance tests that make his friends look like lazy and unfit slackers who only care about eating, drinking and scratching their, uhm, corks on the couch. Maybe I should just go ahead and change his moniker to Bernard Vin-ault. ...is the chief white cultivar in Iraklio Prefecture in Crete and the only variety permitted under the Peza OPAP appellation for white wines. Vilana produces fresh, low alcohol wines perfectly suited to quaffing in their region of origin. Despite the appellation, however, Vilana wines can display a wide range of quality. They are prone to oxidize and quality is greatly affected by vineyard elevation, orientation and yields. At its best, Vilana produces Granny Smith fruit on the nose and mouth. Less conscientious treatments can be pleasant and light, but a bit mushy and nondescript as well. I took notes while the guru spoke. Additionally, Decanter's World Wine Awards 2010 (Greece's region chaired by Nico Manessis) advises wine lovers to keep an eye on the "2009 Vilana, varietal or blended, from Crete. This spicy white took a big step-up this year, showing the differences possible in these wines." So now I will just shut up and let the man speak his truth. 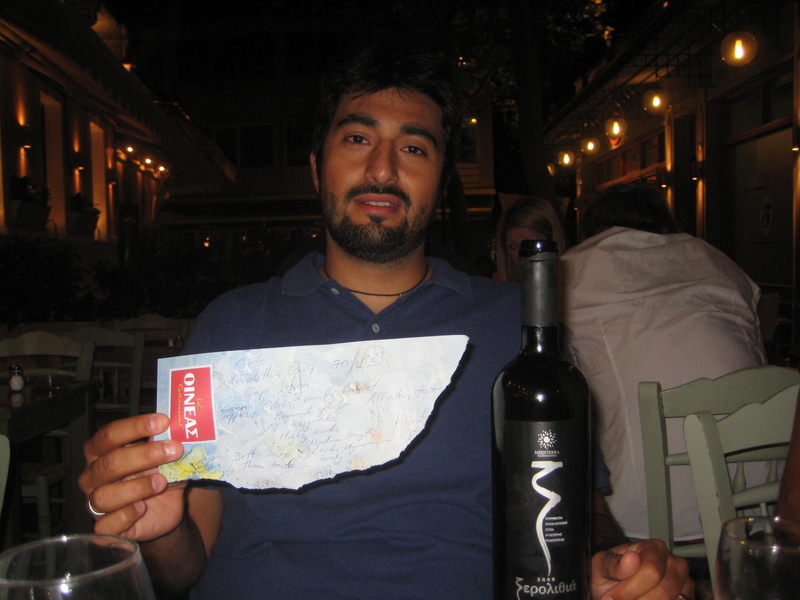 2009 Xerolithia, Peza, Crete (Vilana) - Green apples, citrus, vanilla bouquet vaguely reminiscent of an Assyrtiko. Taste is mostly citrus with medium length. Highly acidic, lacks body and dynamism, a tad fizzy. Its nose is much better than its taste. 70/100 (according to the French Connoisseur) but, since these are times of economic crises and I tend to grade on a steep curve, I am taking the liberty of boosting the wine's grade up to an 82/100. Yes, I did taste it too and it was just okay.